The Lakers had a successful day today on the Charles river with both the Men’s Club Four and the Woman’s Collegiate Four finishing in the top ten in their respective events. The Men’s and Women’s Alumni eights also had admirable performances and represented the program with a lot of enthusiasm. The weather conditions were very favorable and resulted in a great race by all. The Men’s Club Four had a great race this afternoon and ended up finishing higher than any other Grand Valley Men’s Four at Charles in program history. The crew ended with a time of 17:15.49 in their top ten finish today. The Women’s Collegiate Four had came into the day with high expectations following last years second place finish. The team fought hard but came up a little short of last year and ended finishing ninth with a time of 19:09.40 this evening. The Alumni Men’s and Woman’s eights represented the program well today against other alumni from some of the most prestigious schools in the world of rowing. The men finished 28th after a crash with Wisconsin slowed them down to an eventual time of 16:28.33. The women also had a good race although no crashes to report in their finish of 25th with a time of 19:59.24 in their race this afternoon. Overall the Lakers had a fairly successful day of racing at the Head of the Charles Regatta as day one is in the books. Now all eyes are set to Sunday when the Men’s and Women’s Varsity Eights will be competing in their respective collegiate events. “The boat that stood out today was the Men’s Club 4+ who had one of the best races of the day but all boats did well”, said head coach John Bancheri, “The races today showed us where we are right now and that we are on track as continual improvement will lead to increase speed”. The women’s collegiate 8+ will race at 3:06 pm and the men’s collegiate 8+ will race at 3:41 pm. You can watch the live feed here. The Dinner plan for Friday night has changed. Dinner tonight is now at 6:30pm at a different Fire+Ice location. Dinner will now be held at the Fire+Ice located in Downtown Boston at the address: 205 Berkely Street. 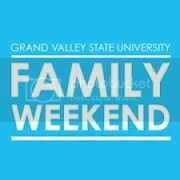 This weekend the entire Grand Valley will celebrate Family Weekend, an annual tradition for the University. The Laker Navy will also be participating in the weekend festivities by opening up their boathouse and training center for visiting parents and families! Family members of our 2013-2014 novice class will be able to explore the training facilities that their rower is becoming accustomed too and even get to take a spin in a boat! We invite parents of rowers new and old to join us this weekend at the Boathouse as the Lakers will be christening our newest boat, the Richard Laurance” at 11 am on Saturday October 5. It should be a great weekend and we look forward to seeing your face with your rower at the boathouse!